There are several ways in which to make housing more energy efficient. In general, quite a few of these methods are only truly accessible to new builds, but there are also a few attractive retrofit options available to all of us who will probably not be building our own passive houses anytime soon. When thinking about energy efficient housing, one generally thinks of reduced direct energy consumption, especially with regard to heating and cooling. Better insulation, draught-proofing and heat recovery ventilation are common themes in this regard. Depending on how energy efficient your home currently is, these basic green home options might provide some easy wins. You can estimate the current level of efficiency of your home here. 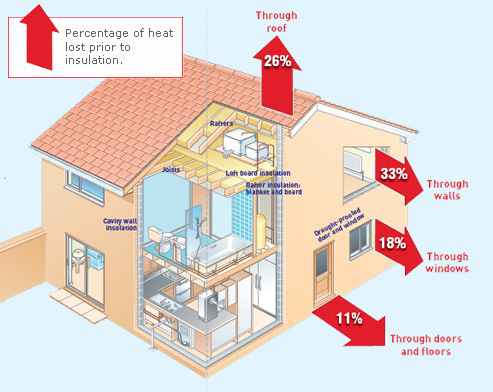 Note the large savings that can be achieved in a home with little existing energy saving measures. Once some initial measures are put in place, however, further savings become harder to achieve. In a typical home, the best value can often be derived from properly insulating the loft. Since it is rarely used, aesthetics is less important, making insulation solutions cheaper and easier to apply. The ceiling also typically covers a large surface area over which heat can be transferred, making this the best place in which to get maximum bang for the insulation buck. For those who had no insulation before, payback periods from loft insulation are typically 1-2 years after which you win all the way. Wall insulation can also result in very large gains in home energy efficiency, but can be more challenging and expensive to carry out. However, if you have cavity walls which are not yet insulated, this can be done quite cheaply, resulting in payback times around 3-4 years. Things become more expensive and challenging for solid walls though. When it comes to floors, extra insulation is probably only a good option if you have suspended timber floors which can be accessed from below. For windows, double or triple-glazing typically does not offer very good value for money. Some heavy curtains can be a much better solution. Some significant savings can also be cheaply achieved through draught-proofing. Payback periods of about 4-8 years are typical for professional installation. Finally, heat recovery ventilators offer additional benefits as well as improved air quality. However, payback periods are longer and the overall solution is more complex than simple insulation and draught-proofing and should therefore be further down the home greening list. In many cases, home energy saving is one of those things that just require a little bit of initiative to greatly improve your living environment in terms of finances and environmental impact. Don’t be lazy now. Let’s get it done.